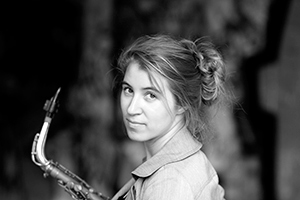 Charlotte is a New York-based alto saxophonist and composer originally from Berlin. With a unique concept of tone and composition, she is making a mark on both the Brooklyn and German jazz scenes. Charlotte has been active as a private Saxophone, Flute and Clarinet Instructor since 2009. Furthermore she has gained additional teaching experience at New York University as an adjunct music instructor and taught at several workshops and masterclasses. With her band Lisbeth Quartett, she has released five albums as a leader – Grow (Doublemoon Records, 2009), Constant Travellers (Traumton Records, 2011), Framed Frequencies (Traumton Records, 2014), Lisbeth Live (Traumton Records, 2016 ) and There Is only make (Traumton Records). The second of these was awarded the Echo Jazz Prize in 2012. In Brooklyn, Charlotte formed a new band named Wood River. They released their Debut LP in February 2015 and in 2017 collaborated with a 60 piece choir to perform the premiere of “Sediments We Move”, a piece written by Charlotte. Further projects in New York are the Alto Saxophone quartet Asterids with Alto colleagues Caroline Davis, Oscar Noriega and Caleb Curtis as well as a trio with Vinnie Sperrazza and Chris Tordini called The Choir Invisible. As a sidewoman Charlotte appears regularly in different outfits of Arooj Aftabs band on Saxophone, Flute, Clarinet and synthesizer. Born in 1988, Charlotte began playing classical flute at the age of eight and picked up the saxophone at age the age of sixteen. She received her undergraduate degree at the Jazz Institute Berlin in 2012. The same year, she moved to New York City with the support of a scholarship from the German Academic Exchange Service (DAAD) to pursue a graduate degree in the jazz program at New York University. Charlotte’s most important teachers and mentors throughout her artistic journey have been John Hollenbeck, Mark Turner, Greg Cohen, Peter Weniger, Kurt Rosenwinkel and Billy Drewes. As a teacher it’s just as important to find out about the student’s strenghts and weaknesses as well as their character when it comes to the learning process. Every mind functions so differently in terms of learning something new and teaching new skills to both body and mind that its crucial to find the exact spot for each student where challenge and reward are balanced. Like that, motivation stays alive. I enjoy the fact, that no matter the age, experience or level of expertise, both teacher and student can learn from each other. If both sides are open, lessons can be a mutual learning process because both sides have mastered something different and can share their perspectives on looking at a piece of music from two sides. Seeing the joy and pride in a students face when understanding or accomplishing something new makes me very happy.